White people taxes enabled civilization. Nothing has changed. Depends on the city as many are loosing their white people who do most of the work and pay most of the taxes. One threatens the system, another one helps the system. The first is a client that uses the second. IRC clients can also work over Matrix because magic. I dislike all of you people, but nobody deserves to be censored. Have this: https://about.riot.im/ https://matrix.org/ The first is a client that uses the second. IRC clients can also work over Matrix because magic. Additionally, it is looking like gab is hoping to stand apart from just being a twitter clone, and is looking to improve their "group chat"
Does gab have voice chat as well as text? Because that's why my friends and I use Discord when we're gaming. And while that is a good thing, it is really only viable if you have a pro-account. Now, that's not to say people are not willing to pay a little to both keep the site up and to use more advance features, it's just still a bit of a barrier as small as it is. Yes, run your own open source matrix server/clients! This really isn't what winning looks like. The amount of racism against average white people and anyone to the right of Stalin is forcing white people to accept their identity as white first. Go look on twitter at the number of extremely high retweeted and liked tweets saying all white people are responsible for this one guy. >is forcing white people to accept their identity as white first Idk if that's true. RIGHT NOW, this is the MOST important thing on our plate. Win, and WIN BIG, will FORCE the MSM and the Pols to explain this win, thereby forcing them tacitly admit they DID not present the events of August the 12th, completely, and with "total honesty". There's no way to "lie", or "omit" your way out of it. "But I don't understand Mayor Signer, why do we have to pay $(this huge amount of money) to the Organizations of The August 12th event?" "Well, it's because the federal judge is racist. The federal courts are stacked with racists." No one is gonna buy that. People will demand answers. Money usually does that. I'm of course over-simplifying it but u get the idea. ^This. RIGHT NOW, this is the MOST important thing on our plate. Win, and **WIN BIG**, will **FORCE** the MSM and the Pols to *explain this win*, thereby forcing them tacitly admit they DID not present the events of August the 12th, completely, and with "total honesty". There's no way to "lie", or "omit" your way out of it. *"But I don't understand Mayor Signer, why do we have to pay $(this huge amount of money) to the Organizations of The August 12th event? "* *"Well, it's because the federal judge is racist. The federal courts are stacked with racists. "* No one is gonna buy that. People will **demand** answers. Money usually does that. I'm of course over-simplifying it but u get the idea. The low IQ larp faction must be brought to heel or disavowed. They are ruining our moment. What are you, a jew, of course we're winning. We need MORE Swastikas, more Klan hoods, more car attacks. /s The low IQ larp faction must be brought to heel or disavowed. They are ruining our moment. There is nothing wrong with Swastikas and Klan hoods, they knew who the enemy was. It's time to stop letting them shame you into silence. I am an anti-Semitic, white supremacist and believe every single leftist should be publicly lynched. Boycott. Find new platform is all i do lately. But i won't stop. The day i/we stop 'they' win. Matrix using Riot is probably the best bet. Using matrix to connect to the IRC networks and doing searches I just found #voat on freenode. You just have to use the room directly and do a search for #voat on the freenode network. [Matrix](https://matrix.org/) using [Riot](https://matrix.org/docs/projects/client/riot.html) is probably the best bet. Using matrix to connect to the IRC networks and doing searches I just found #voat on freenode. You just have to use the room directly and do a search for #voat on the freenode network. Yep, like "building a business" on Youtube. That's like opening your store inside another store. Fine, until you piss them off. Go for Matrix.org. It's open source. I guess I'm an old fogey, I'd suggest plain old IRC. Title-text: 2078: He announces that he's finally making the jump from screen+irssi to tmux+weechat. Works just like irc and you can connect to irc servers like freenode. It just as the addition of the matrix multimedia stuff like images. Now if we can get a Hatreon tip widget built in that would be amazing. https://matrix.org/ For the lazy. Now if we can get a Hatreon tip widget built in that would be amazing. 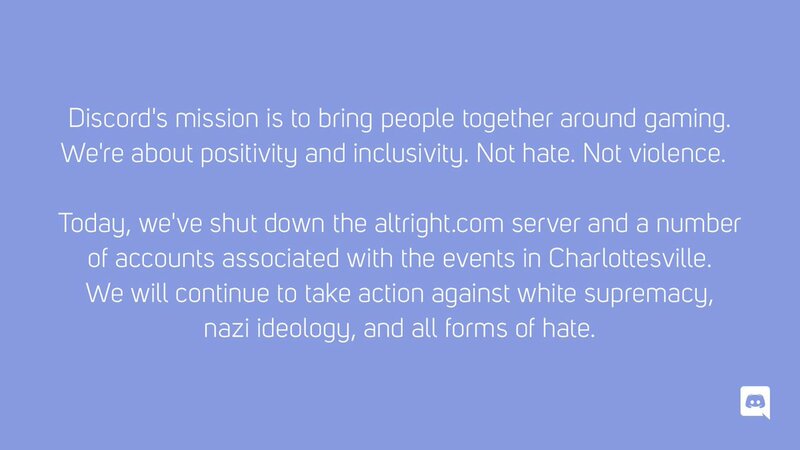 Why aren't they shutting down antifa discords? Why would they silence their allies? They claim they will if any are reported and violate their TOS. I don't have the time to deal with this personally. And of course I got no response to a DM with them. I get the feeling they were expecting high fives and hugs from everyone and not to be called out. They claim they will if any are reported and violate their TOS. I don't have the time to deal with this personally. And of course I got no response to a DM with them. I get the feeling they were expecting high fives and hugs from everyone and not to be called out.